Diepenbrock’s interest in Joost van den Vondel, the greatest Dutch poet from the Golden Era, was kindled at an early age. Both of his parents were members of a society that came together to read plays. Meetings regularly took place in the Diepenbrock residence. The cultivated group had a broad interest: besides classical authors such as Schiller, Goethe, Lessing and Shakespeare, it also explored contemporary French writers such as Dumas and Hugo in the original language. However, its favourites were Bredero and Vondel, whose poetry Diepenbrock was brought up with. The society was founded by a cousin of Diepenbrock’s mother, J.A. Alberdingk Thijm, one of the leaders of the Catholic revival and the driving force of the Vondel renaissance that took place in the last quarter of the nineteenth century. Thijm wrote popularising articles, evoking images of Amsterdam at the time the Golden Era, with Joost van den Vondel as main character. Thijm’s poems and novels inspired the young Diepenbrock’s love for “the beautiful and famous city” (as Vondel called it). At the age of 25, after having completed his studies in Latin and Greek, Diepenbrock accepted a position as a teacher at the municipal grammar school in the quiet provincial town of ’s-Hertogenbosch. In his correspondence from this period, we read that he was often homesick for Amsterdam and his circle of friends consisting of painters and literati. He frequently travelled to the capital to attend special concerts. To stay in touch, he and his friends paid each other visits that often lasted more than one day. From 10 to 12 July 1892 Diepenbrock, Albert Verwey and his wife Kitty van Vloten stayed with Herman and Wies Gorter in Amersfoort. No doubt Vondel’s work was mentioned, as at that time Verwey was busy with the upcoming publication of Een inleiding tot Vondel (An Introduction to Vondel). On 6 September Diepenbrock asked him in a letter: How is Vondel getting on? In this context it is not surprising that Diepenbrock set Vondel’s Rey van burchtsaeten (Choral Song of the Burghers) for choir a cappella soon after that. On 14 September 1892, the beginning of his fifth school year in ’s-Hertogenbosch, Diepenbrock wrote to his friend Andrew de Graaf: I have started a very beautiful work, if all goes well, it will be neither large nor long, but pleasant and small. (BD I:381) This is the only reference to the genesis of the Rey van burchtsaeten, apart from a remark in a letter from Diepenbrock to De Graaf, dated 29 November 1892: Until this week I was still busy with musical issues. (BD I:408) Diepenbrock’s original manuscript of the Rey van burchtsaeten has not been transmitted, but the neat copy has survived; according to the date given at the end, it was made between 26 January 1893 and 25 September 1894. Meanwhile, Diepenbrock had started on the Rey van clarissen (Choral Song of the Poor Clares, RC 30) and the Rey van Amsterdamsche maegden (Choral Song of the Amsterdam Virgins, RC 31) from Vondel’s Gijsbrecht van Aemstel. 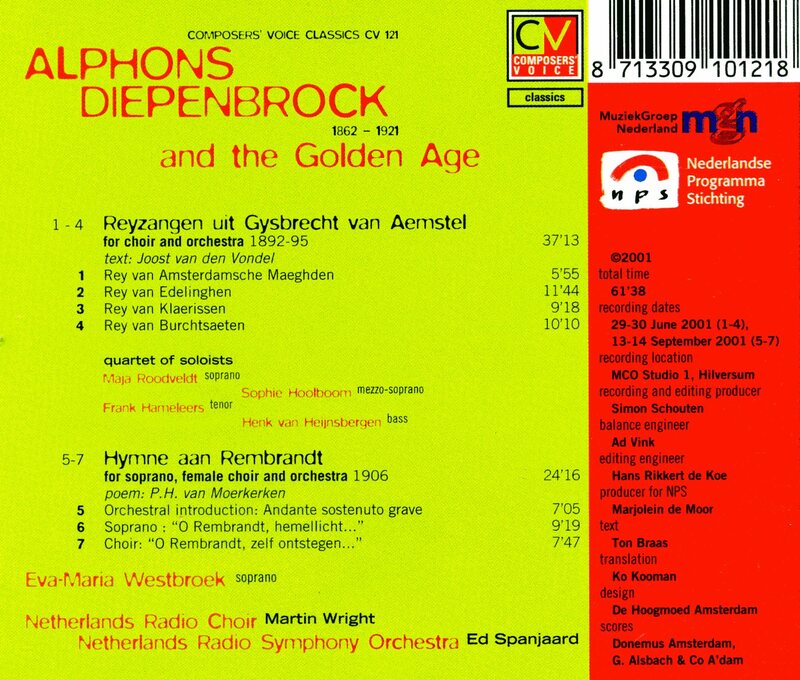 The Rey van edelingen (Choral Songs of the Noblemen, RC 33) is the following large-scale composition in Diepenbrock’s oeuvre. Before expounding on the genesis of these four works, we will first give a summary of Gijsbrecht van Aemstel. Vondel’s historic play is situated in the Middle Ages. It was inspired by Virgil’s Aeneid, which describes the downfall of Troy. Amsterdam, which for a long time has been besieged by troops from the nearby town of Haarlem and Kennemerland, breathes a sigh of relief when the enemy suddenly retreats in disarray. The reason for this, so an abbot has heard, is a disagreement between the leaders. This is confirmed when questioning a captured spy of the enemy. He points out a ship full of brushwood – valuable winter fuel – which has been left behind in the rush. Elated and triumphant the Amsterdamers haul the vessel, which is shaped like a giant sea horse, into the city walls and start making preparations for the Christmas celebrations, as they were called on to do by the Rey van Amsterdamsche maeghden that concludes the first act. At the end of the second act the congregation goes to church while singing the Rey van edelingen. Meanwhile, the lout turns out to be the infamous Trojan horse: at night enemy soldiers creep out of it and together with the stealthily returned army, they take the unsuspecting citizens by surprise. The fight begins. In the Rey van clarissen nuns sketch the mothers’ grief about the violent deaths of their babies. In act four Badeloch, the wife of Gijsbrecht, is told about the cruel battle that has taken place inside the city walls since the enemy troops have entered by means of deception. She is afraid she will never see her husband again. This is followed by the Rey van burchtsaeten. Badeloch’s fears turn out to be ungrounded; Gijsbrecht returns unharmed. He wants to send away his wife and children and go down with the city, but Archangel Raphael orders him to get into safety with the others in order to lead the glorious resurrection of Amsterdam. Ever be found in the world? The text also expresses the onlooker’s compassion with Badeloch who is desperate about her husband’s fate and it ends with a prayer to God to lighten the burden of the grieving wife. Vondel’s text consists of eight six-line strophes. 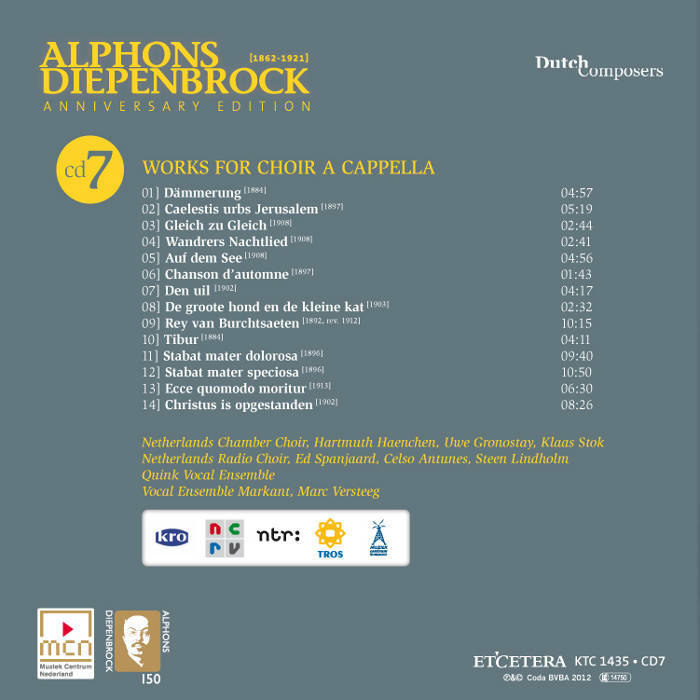 Diepenbrock begins five of the strophes (strophes 1 to 4 and 8) with the theme. 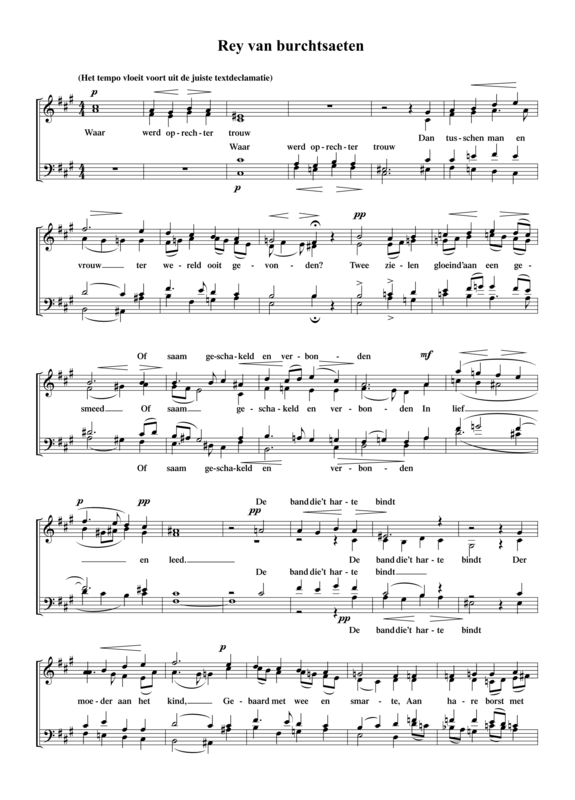 With this theme the voice pairs soprano/alto and tenor/bass open the piece and the voice pairs soprano/tenor and alto/bass open the second strophe in mm. 19-21. The strophes 5, 6 and 7 start with a different, less prominent theme that brings together major and minor in one measure. In the sixth and seventh strophe Vondel compares Badeloch’s grieving with the lamenting of the turtle dove on the branch of a dead tree after losing her beloved mate – for the rest of her life. Diepenbrock elaborately expresses this text with long melismas on the word “jammert” (laments), in which both triplet quavers and ‘ordinary’ quavers occur. The passage is reserved for the solo voices. Throughout the work, which consists of 140 measures, chromaticism plays an important role and there is a quick succession of key changes. Diepenbrock only attended the dress rehearsal for the performance in Leiden by the local Toonkunst Choir, conducted by Daniël de Lange on 6 December 1900, as the concert coincided with the premiere in Amsterdam of his two Hymnen an die Nacht (Hymns to the Night, RC 49 and 50). Thanks to this comment we know when the composition was started after all. When in 1912 Diepenbrock prepared the score of his Gijsbrecht for a performance of Vondel’s tragedy by the N.V. Het Tooneel of Willem Royaards in the theatre of Amsterdam, he also scrutinised the Rey van burchtsaeten, which was to be sung a cappella by a small ensemble. In some passages he simplified the voice leading. He opened the third strophe with the theme sung merely by the voice pair tenor/bass. The fourth strophe had a different modulation and ended a semitone lower, resulting in a dominant-tonic instead of a third relationship with the following section. Of note was the word painting at the end of the fifth strophe, where the text says marital love is the most powerful cement that “harten bindt, als muren breken / Tot puin in ’t end” (connects hearts, where walls crumble / finally into rubble). Now Diepenbrock ended on a low c-sharp unison in the four voices, with a descending fifth in both the soprano and the bass. In order to make things easier for the soloists, he gave the option of an eight-measure caesura in the “lament” strophe. En hart met hart te gader. Die liefd’ is sterker dan de dood. Tot puin in ’t end. And heart with heart together. That love is stronger than death. Has kindled in the world. May crumble into rubble in the end. To water and to tears. 13 sept 1906: Bij de uitgever S.L. van Looy te Amsterdam verschijnen in druk Vier Vierstemmige Liederen waarin Den uil (RC 56), Vijftiende-eeuwsch bruyloftslied (RC 10), Oud paaschlied uit Twente (RC 57) en Rey van burchtsaeten (RC 28) zijn samen gebracht.